Extraordinary roof insulation, which can more! Whether old building, new building or roof renewal, with a rafter insulation the tile roofing is already integrated to our system. Step by step the insulating system is applied together with the roof cover. Other usual and costly constructions are no longer required. Thanks to the interlocking system of the elements no thermal bridges and joints can arise and therefore a windproof protection is also guaranteed. Rain and wind, these weather conditions can cause that it becomes wet even underneath the roofing tiles. This humidity is drained by a water dispersion system to the gutter. Herewith is guaranteed that no water can penetrate even with defective or missing tiles. The elements are available for almost every kind of tiles or concrete roof stones! Save costs in the long run and low CO² emissions! Without insulation a lot of energy gets lost through the roof – whether heating or cooling of the building. The roof is the construction body which is most exposed to the environmental influences which are redirected to the building - energy loss is the result. Our insulating system reduces this energy loss to a minimum – the result is a comfortably indoor climate. 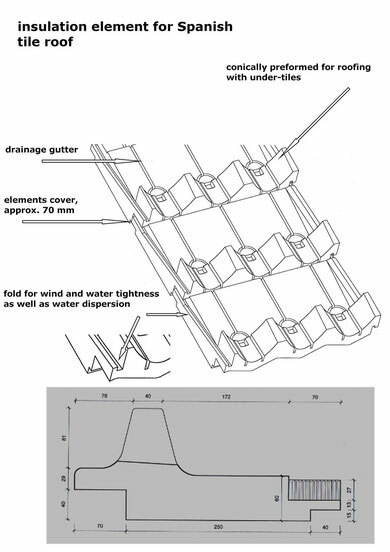 6. suitable for almost every tiled roof, e.g., clay tiles (also fluted tiles), plain tiles, concrete roof stones etc. 8. suitable for almost every substructure, e.g., concrete, clay blocks, wood, metal and much more. And all at a convincing cost effectiveness!